After a morning of booking things and eating gelato, we headed downstairs for our 2pm tour and found our driver already waiting for us. 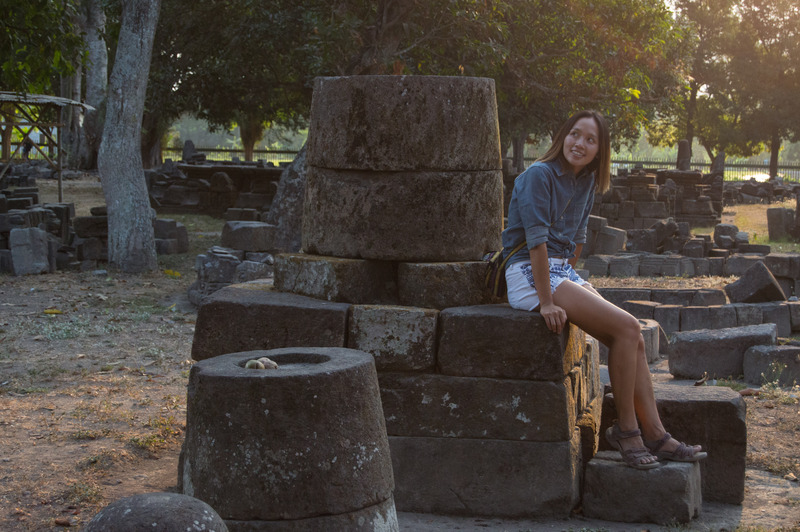 As we were the only ones that had booked the tour for the sunset at Prambanan and subsequent ballet, we had the vehicle all to ourselves. 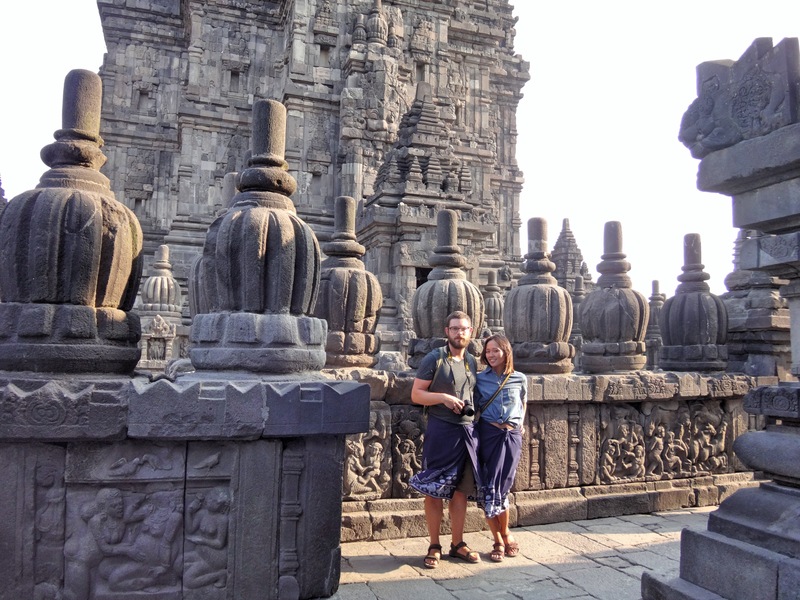 The tour consists of wandering around the Prambanan temple grounds and attending a dance performance of the Ramayana Hindu epic afterwards. We foolishly didn’t buy our ballet tickets in advance (more on that later). Of note: To Westerners, “ballet” has strong connotations. Here it refers to a story told through dance, but without the classical aesthetics or athletic movements of European ballet (it is, after all, Javanese). There were a number of Europeans around us who mentioned their surprise during the performance. After a 30 minute drive, we arrived at Prambanan. We had gotten a combination pass at Borobudur the day before so we already had our entrance ticket. That morning we had taken all of our laundry to be cleaned, so Allison was wearing short shorts. As this is not proper temple visiting attire, she was given a sarong to wear at the gate. Much to my consternation, I was also given one to wear (perhaps someone would be offended by my knees peeking out?). This made Allison excited, because now we were “cute and matching”. We headed to the temple and were greeted by some young Indonesians who offered to give us a tour. We originally refused, as we had spent the car ride reading a Wikipedia entry to learn more about the site. They insisted, saying it was free – they were trainee guides who had come from Borneo to practice their English. 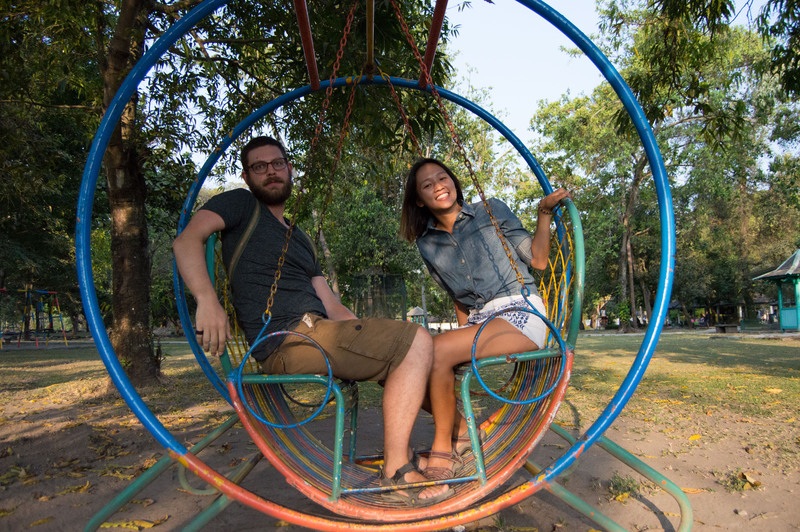 Guiding us was an opportunity for them to speak with real English speakers, so we agreed. 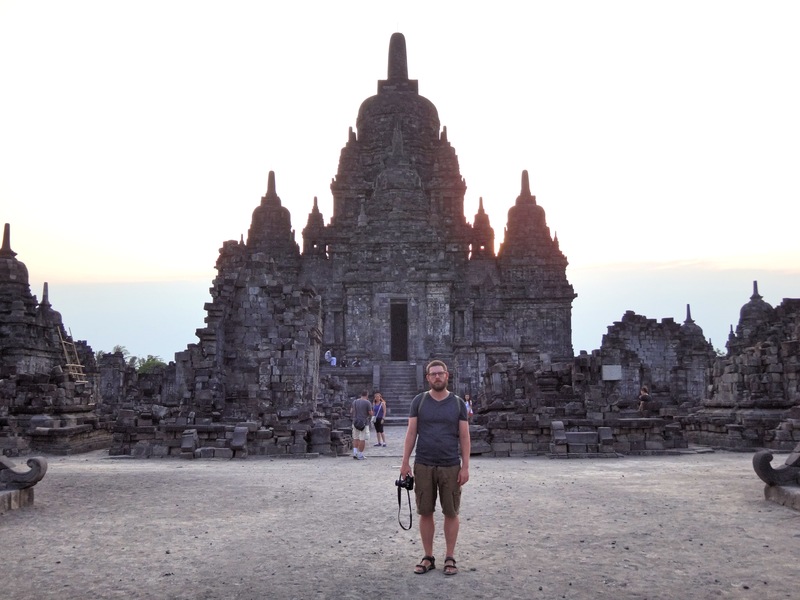 Prambanan is a Hindu temple built in the 9th century, probably to reassert Hinduism when the dynasty at the time took power, as the old dynasty (having made Borobudur) had been Buddhist. 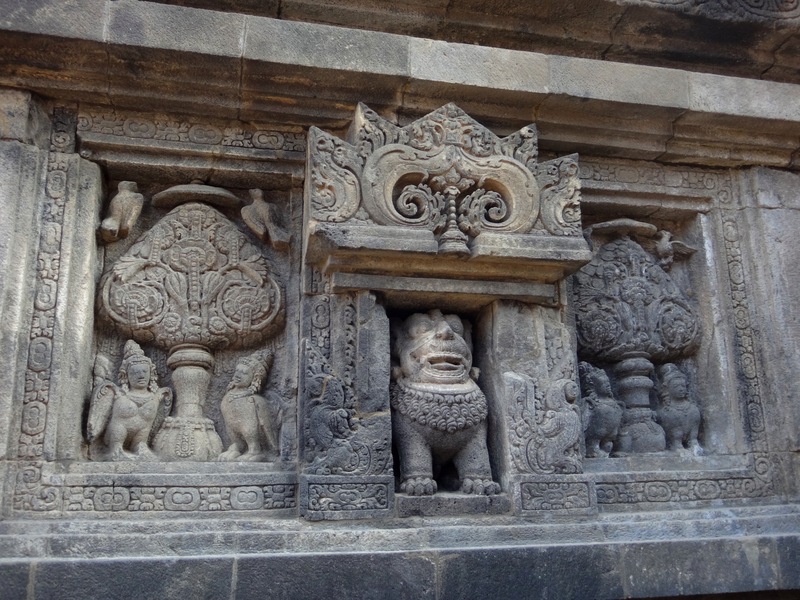 The temple complex consists of three main structures dedicated to Brahma, Shiva, and Vishnu, and three smaller structures dedicated to the gods’ transport/vehicles – a swan (Hamsa), bull (Nandi), and eagle-type bird (Garuda), respectively. 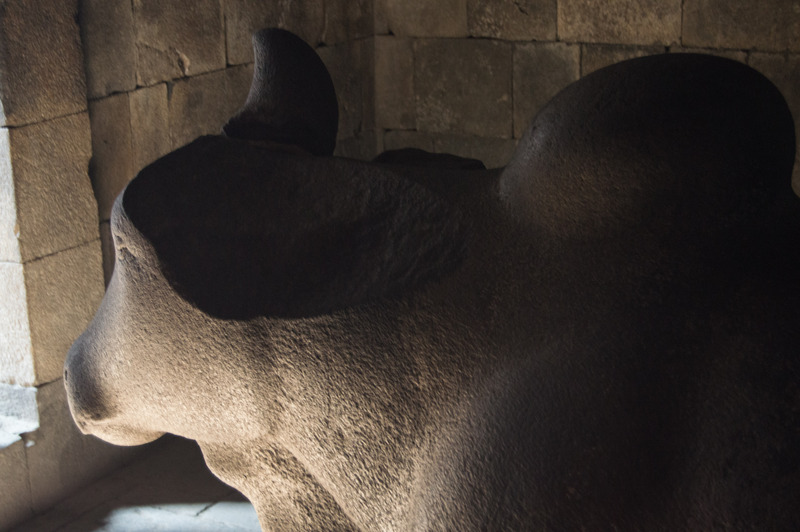 Earthquake damage to the Nandi statue. Unfortunately due to earthquakes and volcanic eruptions (especially the recent 2006 earthquake), the temple has sustained quite a lot of damage that has been repaired to varying degrees. From our Wikipedia research, we knew that many sculptures had been taken by the Dutch, plus locals had taken stones to build houses with. The temple complex held at one time close to 240 structures, but today most are incomplete piles of stones. At any rate, our young guides (both 16) did their best to show us the different remaining sculptures and explain some cursory information (what each figure was holding, how many eyes or arms they had, some basic symbolism). It was nice to try listen to them, almost as if they were giving a high school presentation in a foreign language class. They also showed us the relief sculptures that encircle the Shiva and Brahma temples and tell the story of the Ramayana Hindu epic. The main benefit of their guidance (in Allison’s mind) was that their presence allowed a lot of couple pictures to be taken. We generally don’t have pictures with both of us in them either because I don’t really like featuring in pictures, or because we are too shy to ask randoms. Anyways, we trailed around following our young guides and took a few quick pictures of the main sights. At the end, they asked if we could write a small recommendation or assessment of their English in little notebooks, and took a picture with us. I had been talking to them about Canada and wanted to show them a map, but Google maps failed me, loading the whole world except for North America. After returning the maligned sarongs, we walked to three other temples (some more rebuilt than others) that are a part of the temple grounds and are of Buddhist origin. Along the way we saw boy scouts drilling in the field (much more militaristic than the boy scouts of my youth). Apparently the large open fields in the area allow them a chance to practice marching and camping. Allison made us take self timer photos in the park. 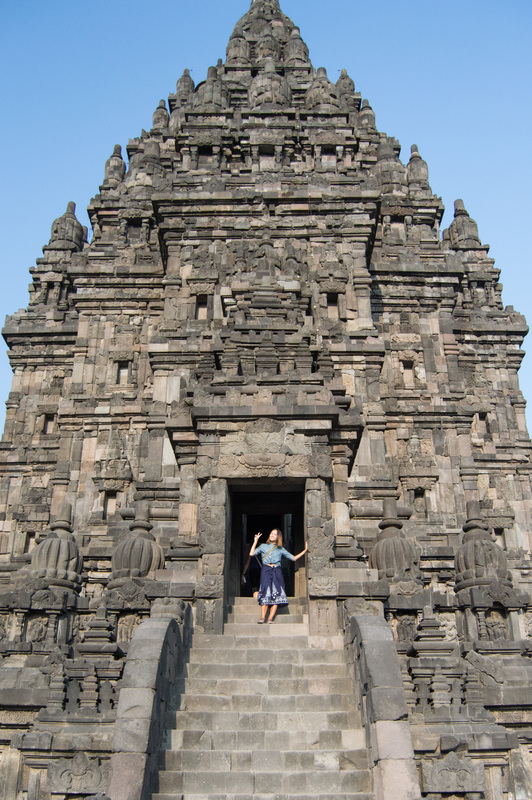 The other temples weren’t much to see (however Candi Sewu was mostly restored), but the weather was warm and sunny so we enjoyed the walk. 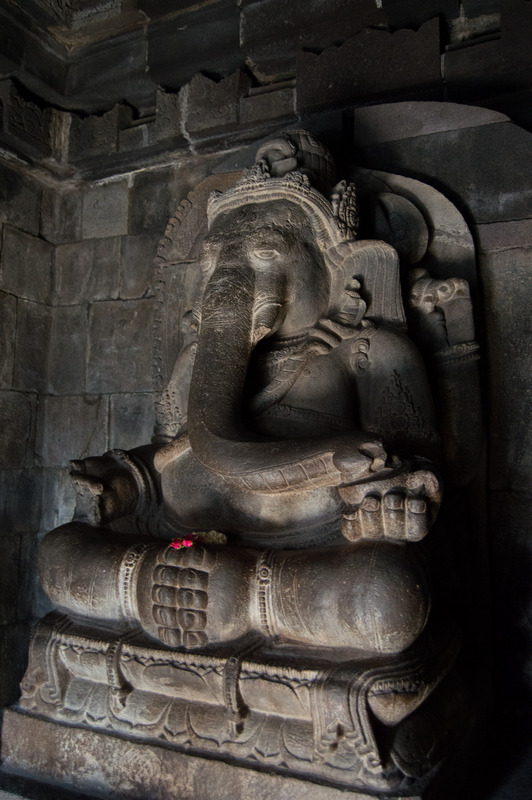 Restoration work is ongoing on these temples and the others, so we expect in a few years they will be more visually appealing. At Candi Sewu we once again saw quite a few headless buddhas, but in contrast to Borobudur, where there were a number of security guards, no one was around. This meant that many of the young silly backpackers were positioning themselves behind the statues and making ridiculous faces in photo ops for their friends. On our way back, we ran across some deer. 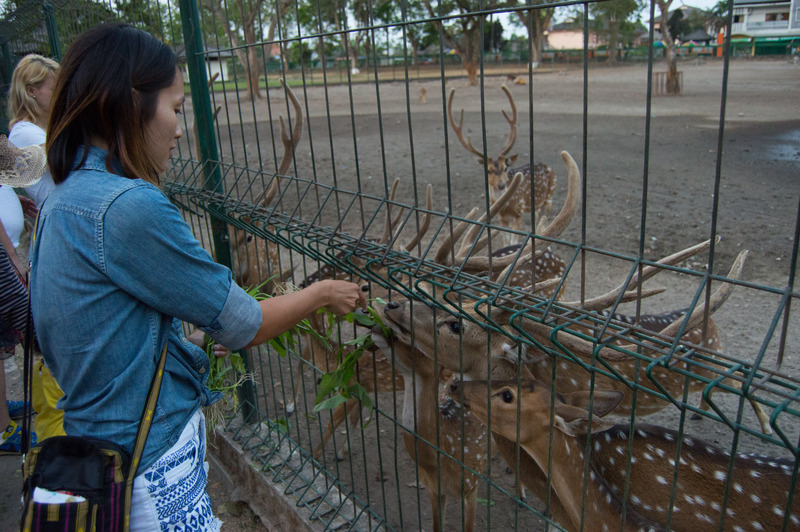 They were all in a large paddock, and for 2000 rupiah (20 cents) you could feed them. Allison had much fun in giving “Rudolph” et. al. a snack. We expect that they might be there because in the Ramayana story there is a golden deer. After finding our guide in the crowds, we were taken to a nice secluded restaurant by a river for dinner. I was anxious to get back to the theatre as we hadn’t bought tickets yet, but Allison steadfastly wanted to relax in the restaurant (we had heard the seats in the open air theatre were concrete and uncomfortable). The argument was abruptly concluded by our guide anxiously appearing and pointing at his wrist, letting us know it was time to go. It was a good thing too; once we arrived at the theatre we saw many tour buses. You can also eat at the attached restaurant (a more expensive option) in a package with your ticket. When we got to the front of the ticket line, we were informed that the performance was sold out. Our guide seemed quite distraught, so while Allison was not-so-secretly pleased by this information (not being too keen on sitting through a long cultural performance) we waited with our guide for the performance to start to see if being “on the waiting list” would amount to anything. 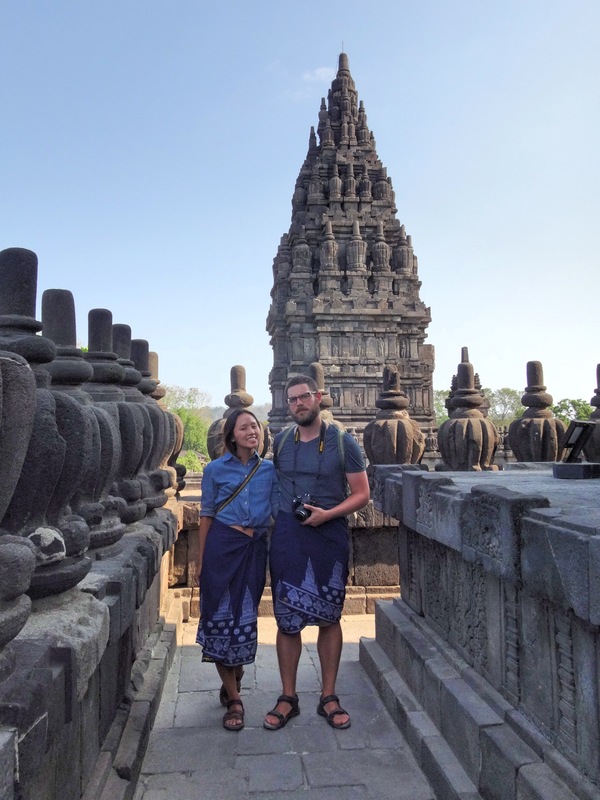 I should note that the reason we ended up at the ballet was because we paid for the Prambanan tour before checking what was included, not because we had desperately wanted to go to the ballet – I was still partially deafened by the oboes of the Mandalay Marionettes. In Canada, being on the waiting list would entail someone taking down your name, or perhaps an orderly queue to one side of the ticket window. In Indonesia, it means loitering around the ticket window and then when tickets are released, all crushing toward it and waving money at the seller. Our guide had been hanging out very near the window, so to Allison’s slight disappointment, we managed to score some tickets. The open air theatre is divided into different ticket classes. You can pay up to ~$37 CAD for VIP seats (couch seats) in the direct centre, or you can spend correspondingly less for “Special”, “Class 1”, or “Class 2” seats. Our Class 2 seats (~$10 CAD) got us onto some concrete risers to the side of the stage, which had some obscured visuals but were for the most part fairly good. The only unfortunate thing was there was a wild group of children in the section on the far right (perhaps a school as they were all wearing matching outfits) who did not understand (and had no adult supervision to impress upon them) that watching a performance does not entail loudly talking/calling to, laughing with, or getting up and visiting your friends. At any rate it was still an enjoyable experience (for me, not sure about Allison). 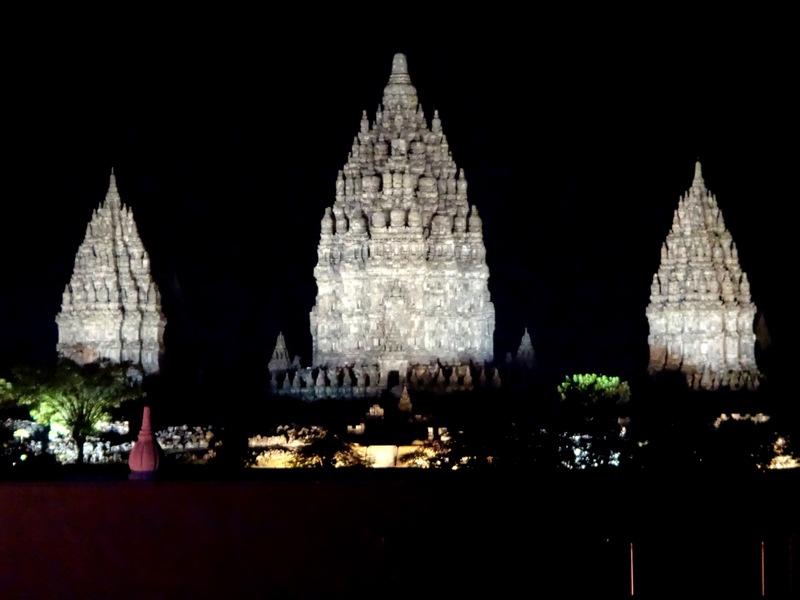 Prambanan lit up at night, the backdrop for the ballet. Vishnu wants to defeat some demons (especially one named Rahwana) so he assumes mortal form in varying degrees in a king’s sons (in the play it was the main character Rama and his brother Laksmana that were the main protagonists). Rama wins his wife Sita in an archery competition in a neighbouring kingdom. But due to some backroom scheming (glossed over in the play) he is exiled to the woods when he would ascend to the throne. There, the sister of the demon Rahwana tries to seduce the brothers but fails, and Laksmana cuts off her nose. She tells Rahwana, who decides to get even. He has one of his minions assume the form of a golden deer to tempt Sita away, but Rama understands it’s a trick. He leaves Sita with Laksmana and goes to catch the deer. During that time, Rama’s voice is mimicked by a demon to make Sita think Rama is in danger. She sends Laksmana off to help him, but not before he puts her in a magic circle of protection. Rahwana, not being able to get to Sita, tricks her to come out by assuming the form of a beggar. Rama and Laksmana later learn of the kidnapping from a vulture that saw what was happening and was mortally wounded in a rescue attempt. Rama meets two monkey kings, and after helping one defeat the other, has him help look for Sita. Hanuman, one of the monkey’s army, finds Sita and tries to rescue her. Rahwana had attempted to make Sita his wife, but failed and is holding her captive. Rahwana’s son captures Hanuman, and they try to burn him alive, but he escapes and sets fire to the demon town instead (this was quite exciting in the play as there were lots of torches and Hanuman set fire to two large faux thatch roofs). Hanuman and the burning town. Hearing of the news from Hanuman, Rama and the monkey army build a bridge across the ocean to the demon kingdom and invade. 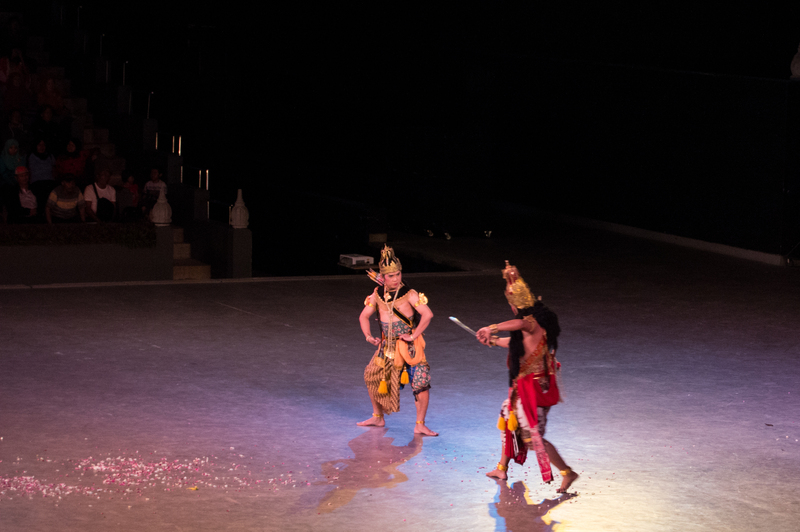 After defeating some giants, Rahwana’s son, and the rest of the demons, Rama and Laksmana face off against Rahwana. 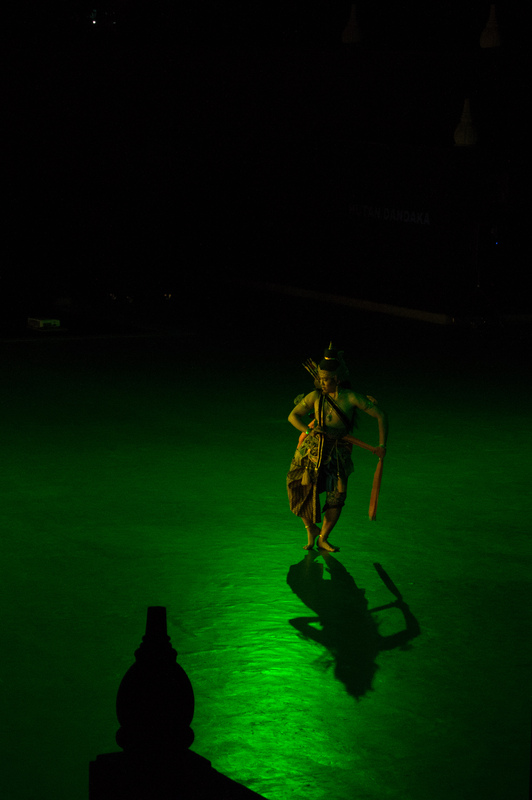 While Laksmana distracts Rahwana, Rama mortally wounds him with his bow (throughout the play, it appeared that 90% of the time someone died it was by an arrow, to the point where we were exhorting Rama to “just pull out his bow already” whenever he was fighting). After rescuing Sita, Rama doubts her purity and so makes her do a trial by fire. When she emerges unscathed the couple happily reunites. Rama and Sita reunited in the Ramayana finale. The story was quite long and sexist (Sita pretty much always has to rely on a man to defend her and apparently her word is not enough for Rama to trust her “purity”) but that is to be expected from a story composed in around the 400s BCE. 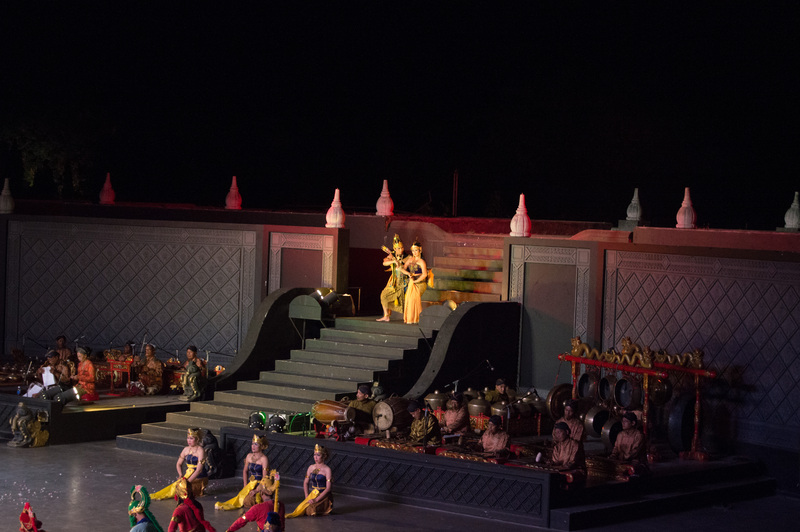 The play/dance was quite good, especially with the imposing Prambanan temples lit up in the background during the open air performance. All in all, a fairly nice outing.